Businessman, Marcel Gaskin has moved to the High Court to challenge the constitutionality of President David Granger’s rejection of Opposition Leader Bharrat Jagdeo’s list of nominees for the post of Chairman of the Guyana Elections Commission (GECOM. In court papers filed by Attorney-at-Law, Glenn Hanoman, the businessman wants the High Court to declare whether the list of nominees to be submitted by the Opposition Leader must include a judge, a retired judge or a person qualified to be a judge. That has been Granger’s position ever since he rejected the first batch of names submitted by Jagdeo. 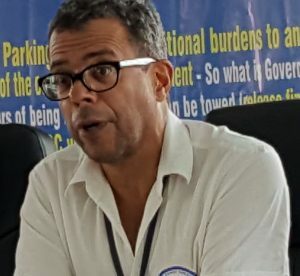 Gaskin said his lawyer has told him that the already rejected list meets Guyana’s constitutional requirement because the words “fit and proper person” must be read as having no connection to the previous categories of persons. Gaskin said Christopher Ram, who is on the first list, is eligible to be a judge because he was admitted to practice law more than seven years ago. The stalemate between Guyana’s two top political leaders deepened on Tuesday when the public learned that the President has since told the Opposition Leader that, among the qualities, a GECOM Chairman must not even be remotely associated with any political party and that the person must not be an activist in any sphere of endeavour. Jagdeo is expected to submit a second list later this month or early next month. The case comes up before acting Chief Justice, Roxanne George- Wiltshire next week. The respondents are Attorney General, Basil Williams and Opposition Leader Jagdeo. Gaskin intends to tender the explanatory memorandum of Bill Number 18 of 1995; Jagdeo’s letter to Granger accompanying the list of nominees; Jagdeo’s submission of the curriculum vitae of the six nominees and a Stabroek News article dated January 20, 2017 titled “I am going to choose somebody who is fit to be judge – Granger on Gecom Chair” to the court to support his case. Granger, a long-time member of the People’s National Congress Reform (PNCR), had been nominated several years ago for the post of GECOM Chairman. The Guyana Trades Union Congress (GTUC) has since warned that those and several other conditions could backfire on the President if he has to unilaterally appoint a GECOM Chairman out of necessity should the stalemate continue. Apart from Ram, the five other nominees were Governance and Conflict Resolution Specialist, Lawrence Lachmansingh; Retired Major General, Norman Mc Lean; Business executive, Ramesh Dookhoo; Indian Rights Activitst, Rhyaan Shah and History Professor James Rose. Marcel Gaskin, who is an active member of the Movement Against Parking Meters, is the brother of Minister of Business, Dominic Gaskin. Dominic Gaskin is President Granger’s son-in-law.